Found in NTUC FairPrice Supermarkets, these frozen pizzas sell for $10.95 for each 9 inch, but were on offer at the price of $13.95 for 2. At $7 bucks a piece, that’s not too bad for pizza in Singapore if the quality is decent enough. As far as I know, the available flavours are also certified healthy choices, being low in sodium and Glycemic Index. Few things can be noticed here immediately upon opening the package for the Spinach & mushroom. One is the disappointing amount of cheese, even though the portions of mushrooms and spinach is decent. The second is ice crystals. Small ice crystals forming on frozen food is pretty normal, but there are clear large ice crystals forming on inside of the packaging as well. This is a sign that it might have been refrozen or left outside the freezer during the transportation process. Not a good sign. Unlike the previous, the Bulgogi one didn’t have large ice crystals at all. In fact it looks really good! My suspicion is that nobody buys the Spinach & Mushroom, which means that unsold Spinach & Mushroom gets kept or moved around more. 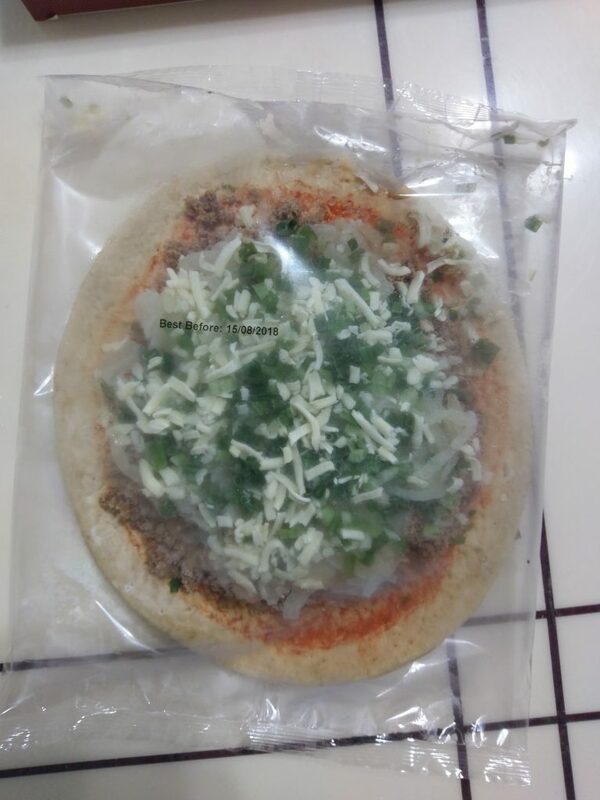 You can see the quartered Bulgogi pizza having less small crystals as well. For my review I wanted to eat a slice of each as a meal. 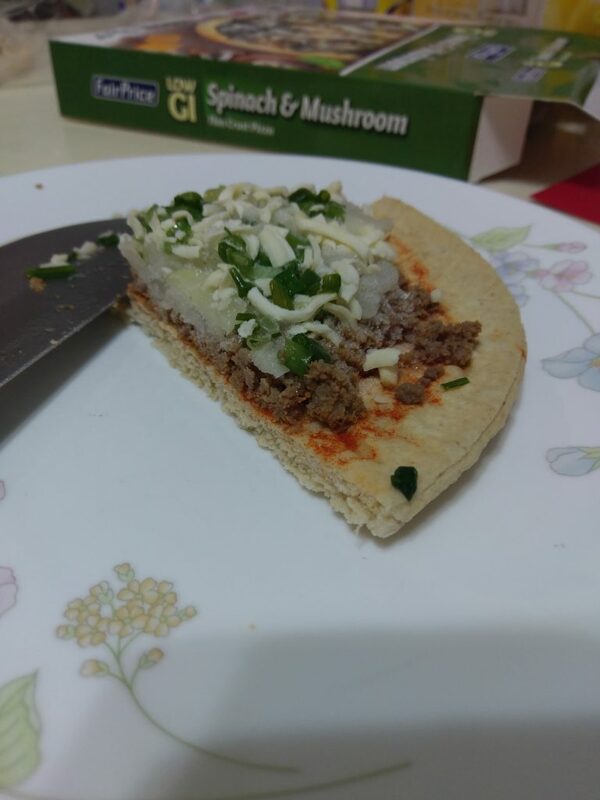 Despite the back of the packaging saying this can make 6 servings, the pizza is really too small and I cut each into quarters instead. 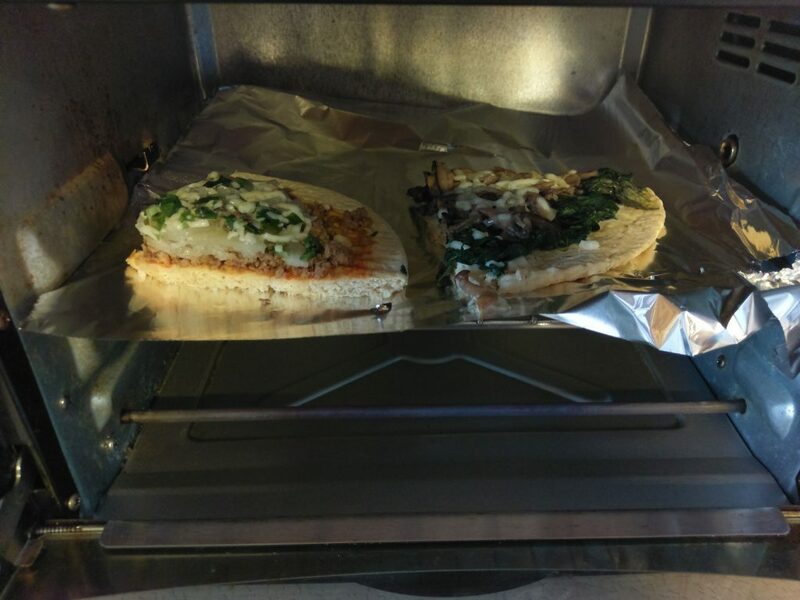 The instructions on the back said to put in the toaster oven for 15 to 18 minutes at 230 degrees Celsius after thawing for 10 minutes. On hindsight, it was a really dumb idea to follow this blindly since they gave similar timings and the same temperature for a conventional oven. A toaster oven might require a lower temperature or timing since it is a smaller vehicle for the transfer of heat. At this point I didn’t know whether to blame myself or the manufacturers, but yeah, it was a little burnt on the sides. 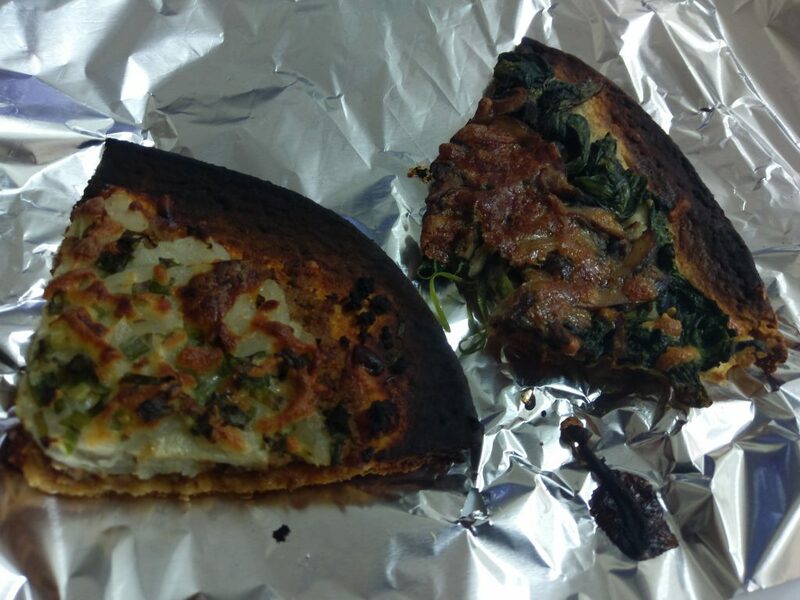 In case you’re wondering what happened to the spinach & mushroom pizza, the oven didn’t eat it. I took a bite before going “Oh yeah, I need to take a photo”. 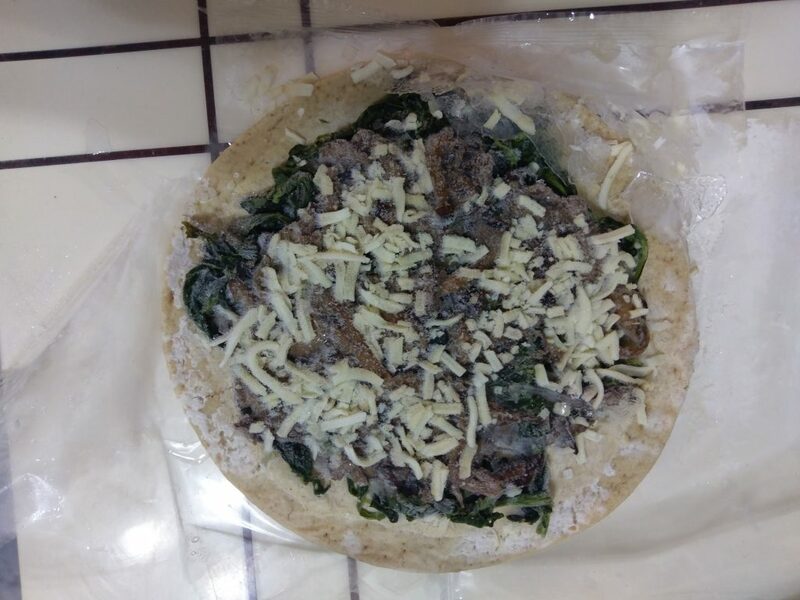 As I suspected from the package, there really isn’t enough cheese on the Spinach & Mushroom. 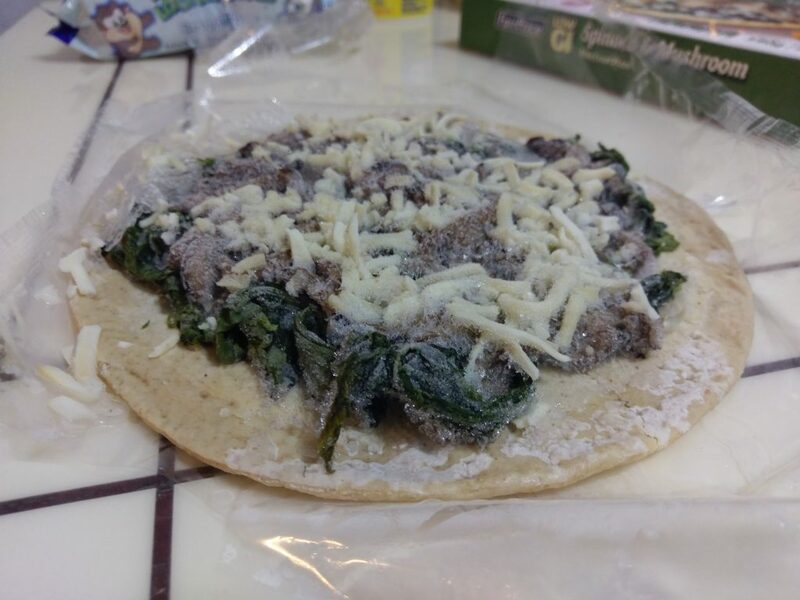 The mushroom and spinach are substantial ingredients here, and the pizza tastes exactly what dough, spinach and mushroom would taste like. It’s not terrible, but it certainly didn’t taste good. 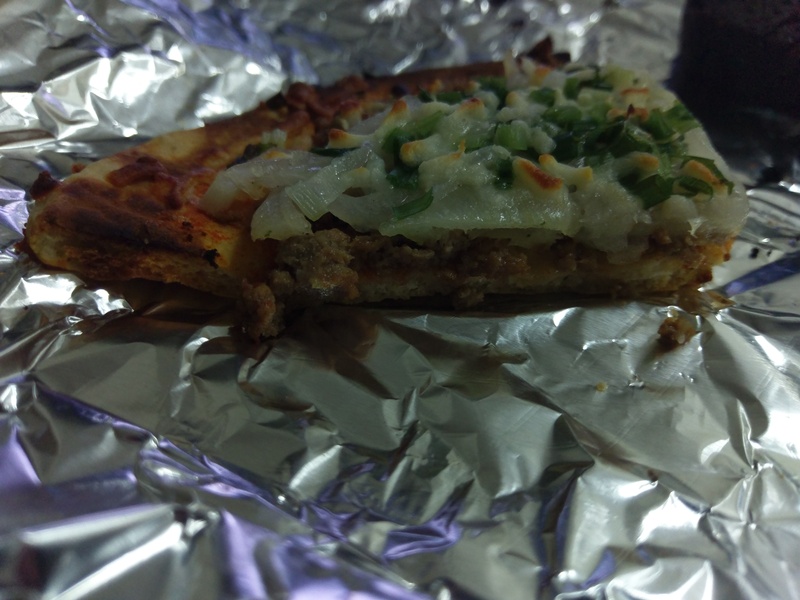 The Bulgogi pizza however tasted pretty good. 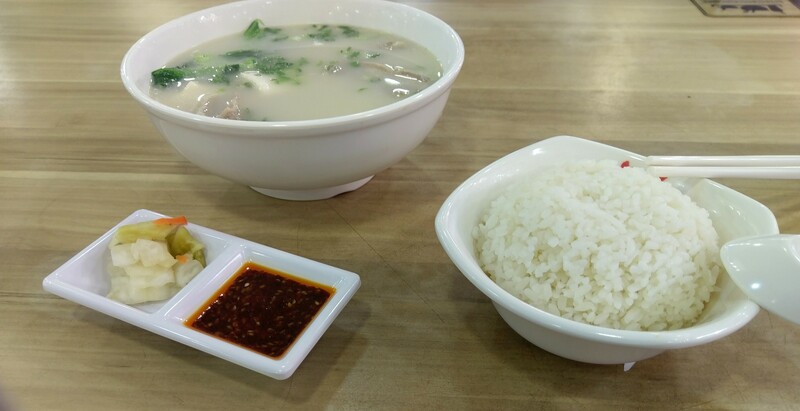 I haven’t been to Korea for Bulgogi, so I wouldn’t be able to tell you if this is authentic (gonna guess it probably isn’t), but there’s a good spicy and sour balance for the sauce with the minced beef. 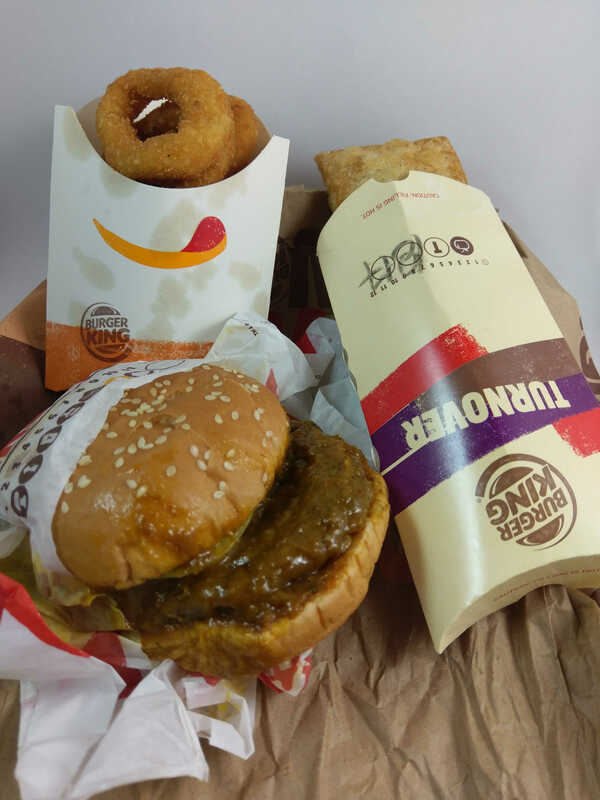 There is A LOT of onions, which provided substantial sweetness that also absorbed some of the sauces below. The onions tasted good, but had a very strong raw onion taste. I’d prefer if they were parcooked or grilled a little more before being packaged. There also isn’t enough cheese. The cheese added a little savouriness to the pizza, but you mostly can’t taste the cheese together with the rest of the pizza. It almost felt like cheese was added in just because. For packaged food it is important to watch the nutritional values and ingredients info as they often include more unexpected items. Another important point of evaluating frozen dinners is whether it actually gives me what the body needs. I did not eat the burnt sides, but despite eating slightly less than 3 servings (according to the package), I did not feel full at all. I went off to get another quarter for the Bulgogi and hopefully I cooked it better this time. Again, it tasted good. But needing to eat this much just to feel full is a problem. The Bulgogi pizza is ideal for a snack, but not so much Pizza parties or as a dinner. The printed nutrition values and ingredients are very healthy for both pizzas. 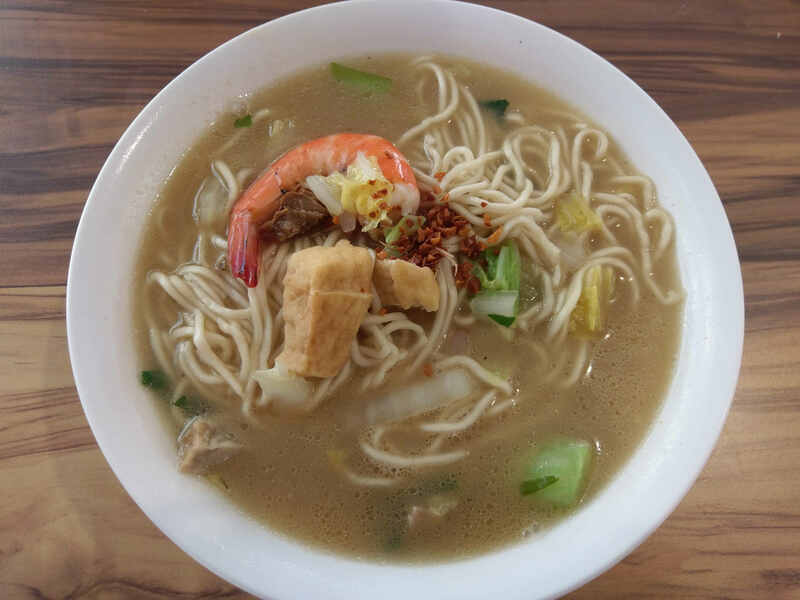 Fresh ingredients are used as ingredients without unnecessary fillings, and even sodium content is very low. The serving nutritional value confirms that this is more suitable as a snack than a meal, as I see that they are below recommended daily intake values. For frozen dinners, I would be rating only with the Worth-it-meter, since there’s really no travelling (in theory). These are not the traditional 0 to 5 out of 5, and only describes whether I think the product is worth it. The higher it is, the more likely I am to keep it in my pantry. I don’t see why you would pay for this at all. At $11 usual price I’d be better off buying fresh pita or flat bread, mushrooms, spinach and cheese and making a batch to freeze myself. Mind you all these ingredients can be found in NTUC itself. I really want to be able to give this higher, as I was generally impressed by how it tasted. The problem is that it is very difficult to say “I feel like eating pizza, lets buy that $11 Beef Bulgogi frozen pizza from ntuc and wait for thawing and the oven to heat” over “I feel like eating pizza, lets order Domino’s 2 for $22 fresh pizza while I laze around”.